The Civil War cost Savannah Darby everything—her family and her home. When Aidan Bedford, an attorney from Boston, buys the Darby estate, he hires Savannah to redecorate. Can she find a mysterious treasure before her job is finished? When Russell Stark returns to Fort Worth, he’s determined to begin a new life. But when he arrives at his mother’s homestead, he discovers that she is very ill and the woman he loved is still as beautiful and sweet as he remembered. With time running out, Russell must come to terms with both his future and his past. These four novellas are rich in history and details of Southern life. I felt like I learned several new things with each story. I was especially surprised to learn that during Reconstruction it was the Republican party that advocated for equal rights for black people and the Democrats were murdering, terrorizing, and seeking to prevent the blacks from exercising their freedoms and voting rights, as well as the Republicans that supported them. What a scary time in history. The bravery and courage of those men and women who acted on their beliefs during such violence and danger is inspiring. Each story has a different setting- a Georgia plantation, a small-town Texas homestead, Nashville slums, and an island for wealthy vacationers. I have a personal preference for characters who experience hardship rather than reading about society's elite, since there is less entitlement and more refining of character. However, the men and women in all the stories seek to overcome hardships and pressures of society to find the path that God would have them follow. 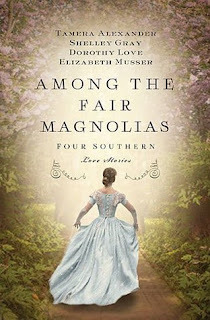 Four best-selling novelists bring tales of four Southern women who face near impossible choices on their journeys in life and in love during the most turbulent decade of our nation’s history in Among the Fair Magnolias. Don't miss this collection of stories from Tamera Alexander, Shelley Gray, Dorothy Love, and Elizabeth Musser. Join the authors in celebrating the release of Among the Fair Magnolias by entering to win their Southern Hearts Kindle Fire Giveaway and RSVPing to their August 13th author chat party! Enter today by clicking the icon below. But hurry, the giveaway ends on 8/13. The winner will be announced at the Among the Fair Magnolias Facebook party. RSVP for a chance to connect with Tamera, Dorothy, Shelley, and Elizabeth, as well as for a chance to win some great prizes! RSVP today and spread the word—tell your friends about the giveaway via FACEBOOK, TWITTER, or PINTEREST and increase your chances of winning. Hope to see you on the 13th!